A technology company hiring a media personality might not make sense at first, but if you dig through the company’s recent past, it begins to make more sense. In a widely leaked move, Yahoo has hired Katie Couric to be its Global Anchor. The role, kicking off in 2014, will frame Couric as the face and leading voice of Yahoo’s growing news and content arm. The hire follows a string of notable pickups by the Internet giant, including David Pogue, Olivier Knox, Walter Shapiro, Megan Liberman, Matt Bai, Virginia Heffernan, and others. It is hungry for more. If you look at Yahoo’s most publicized strategic shift in the Mayer era, it interestingly isn’t content by itself. Instead, Yahoo has made a hard turn into the mobile space with some grace as numerous purchases and a focus on repetitive activity has yielded it a quickly growing mobile user base. Yahoo CEO Marissa Mayer recently reported that Yahoo has 400 million monthly mobile users. In September, Yahoo reported 350 million monthly active mobile users. The company claimed 300 million monthly mobile actives in February. So, in under a year, Yahoo has grown its mobile audience by at least 33 percent. A culling of applications that didn’t fit its new rubric and a rapidly expanding mobile developer force (now over 400, more than quadrupling during Mayer’s tenure) has helped Yahoo deliver applications that are compelling. The firm focuses on building apps that hit repeat daily activities: email, weather, the stock market, and so forth. Nailing those categories means that Yahoo’s apps will have maximum impact, as their usage is high frequency by nature. The company only has to ensure that the mobile experiences that it builds are compelling, and then monetize the heck out of their recurring usage. That’s Yahoo’s recipe to ignite revenue growth, it seems. Its search business, despite managing to force Microsoft to extend a revenue deal, is likely mature and is definitely slipping. Its year-over-year top line is in decline, as is Yahoo’s larger search market share. Yahoo has put its bets on mobile, a space where it controls around 5 percent of search. Will that 5 percent figure grow as Yahoo’s mobile user base expands? Not so far, at least. The company’s market share of mobile search is down almost precisely 1 percent in real terms year to date, or about 16 percent proportionally to its starting share point. That as the company has boosted its aggregate mobile user base greatly in the same period. So, at least so far, there is no positive correlation. That tells us that if mobile is to generate the revenue Yahoo want it to (and that it must, of course), it won’t be search-based. Checking in on Yahoo’s earnings, top line relating to search is the second-largest category for the firm. Yahoo’s largest revenue driver is advertising. So, we’re talking ads sold against user time, which means pageviews and app opens, which means content. We have now come full circle. Yahoo needs to continue to attract people to its mobile properties in growing rates. To do so, it must populate its applications with consistently compelling content, content that is better than what is offered by other applications and companies that are on a similar tip. Yahoo considers news the type of content users will check more than once a day. Also, news content can have a higher per-piece ROI, given that one story can fit into multiple applications. A single sports story could fit into several Yahoo apps, meaning that the company can use one piece of work a number of times, thereby increasing its value. And fundamentally, Yahoo applications are more interesting if they are full of exclusive and high-quality content. Much more so than they would be if there were stuffed with AP and Reuters reprints. If you want exclusive, high-demand content, you go out and get the people that you consider to be chronic progenitors of such copy and clips. So Pogue and Couric. There will be more probably before the year is up. Yahoo is betting that it can monetize its growing mobile presence at rates that will replace the gaps created by declining revenue streams. 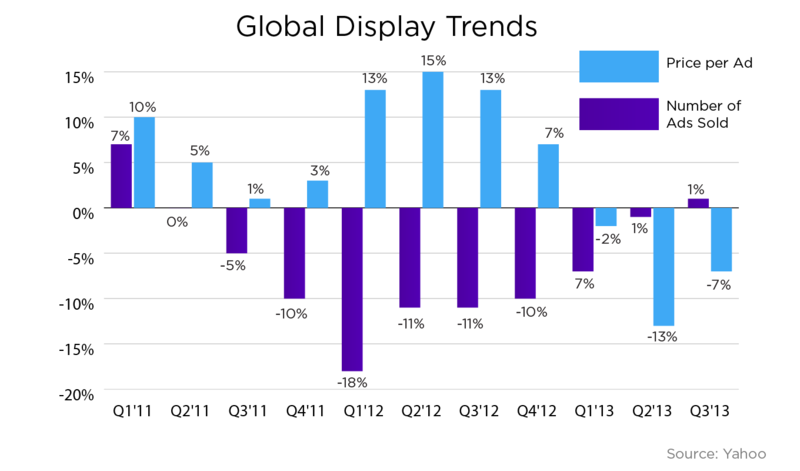 So far, it has been unsuccessful — Yahoo’s revenue continues to decline on a year-over-year basis. Both the decline in price and the increase in volume could be due to growing mobile usage. If we continue to see an increase in sold ads in the fourth quarter, and perhaps another decline in price, I think we’ll have a trend. Companies have notoriously foundered upon mobile shoals. Yahoo is instead charting a course directly for choppy, mostly unknown waters. At a minimum, you can applaud the company’s move as bold. Questions abound: Will Couric’s work be folded into mobile experiences, and if so, in what format? Will Yahoo push hard into mobile video? What are the margins in that content variety? Does Yahoo think of itself as a news organization or a technology company? Will its focus on mobile harm development on its extant web properties? There are far more questions than answers at this point, but the bet is simple: Great content in great apps will monetize at great rates. Call it the Mayer Strategy.